Garden rooms are gaining momentum – I don’t mean sheds or any sort of built thing I mean the idea of intergrating the garden with the rest of the house, blurring the lines between the two. For me at least I have no choice a double height glass wall means I am looking at my garden at all times of the day every day of the year. So I’ve created a garden room – built a brick fireplace (not me personally of course) hung a lifesize resin moose which doubles up as a light on it, clustered oversized Orgone chairs around the hearth, plopped some faux flowers on the hugest coffee table in the world (a massive platter from Ethiopia I found for the store which never quite got there), along with a Philippe Stark gnome stool – some fab huge bronze pots from homebase and done. Phew! You don’t have to go quite as crazy as moi even if you don’t have a garden or terrace planters on sills containing herbs, lavender or anything scented creates an interesting vista. 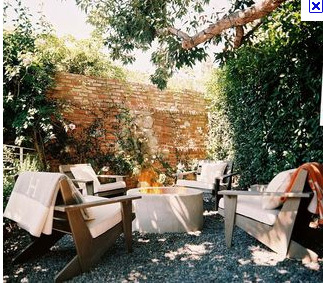 When it comes to outdoor spaces however small I say treat them as you would your indoor space and layer with as much furniture and accessories as you possibly can. Whats the point of having a beautiful eclectic home without a beautiful eclectic garden I say. The weather is supposed to be fine this weekend so if you are off to a garden centre happy gardening. We are car less burgled over a week ago the insurance company have written it off (it was the oldest most hideous car ever so its not that terrible ) however the arguments are. Graham wants practical, reliable, efficient, new and boring and I want and Maud (being a super stylish Welsh terrier wants)Â an old 1968 Merc, preferrably dark green that will probably break down at least once a week, is not practical but will make Maud and I very very very happy what more is there to say! This is what I am banging on about creating a focal point treating outdoors as you would in with cool furniture and accessories. 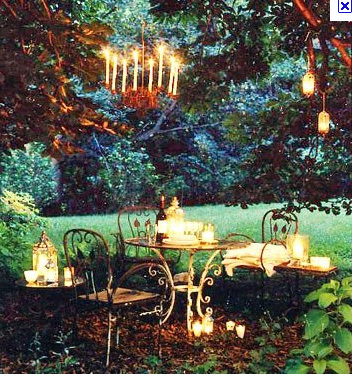 Sweet sweet sweet layering trees with candleabra’s and t-lights ups the style ratings and makes outside as fabulous as in. 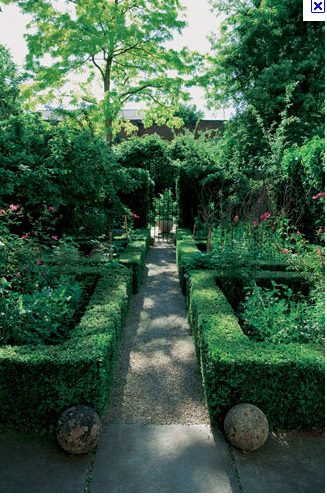 The award for the best garden in the world goes to – Nigel Slater love love love this garden- notice how the planting isn’t shoved against the garden walls (like a doctors waiting room) instead slap bang in the middle of the plot with a little path to wander down.